Australia is arguably the most diverse country in the world. Not just culturally diverse, but economically as well. The incredibly exciting thing about that for property investors is that there will ALWAYS be plentiful opportunities to park our money. For a majority of property investors, they’ve limited those opportunities to only 25 per cent of all options. Key to giving ourselves a chance of making the best decisions in life begins with reviewing 100 per cent of our options. Given how expensive the property asset class is, investing certainly is one of those really big decisions. Our options are contained within the 550 local government authorities (LGAs) that are spread across Australia’s eight states and territories. Each LGA is akin to a company on the stock exchange. 411 out of Australia’s 550 LGA’s are located outside of our eight capital cities. I’ve done the math for you – 75 per cent of our options as property investors are located across regional Australia. 1 in 3 Australians choose to not live in capital cities. Where we want to live is as subjective as ‘steak versus seafood’ – we all have different preferences. Investors need to see property as a financial instrument, not bricks and mortar. It’s irrelevant which city we personally live in. And, anyone who seriously thinks that the ‘capital’ in ‘capital city’ means higher ‘capital growth’ needs a serious reality check. Right now, the number of consecutive months of price declines for Australia’s two largest capital cities is approaching a dozen – it’s next growth cycle is several years away. Darwin is in its fourth year of declines. The property markets in four other capital cities are flat. So, 7 out of 8 capital cities are performing like donkeys and then there’s Hobart (aka ‘Phar Lap’)! Many investors wont realise that Australia’s regional population increased by 77,740 people during the year ending June 2017. The rate of population growth in 33 regional cities and towns was equal to or better than four capital cities. Fact. Many investors also wont realise that the rate of employment growth in several non-capital city locations is far superior to all capital cities.Fact. The residential construction boom that has created an all-time record volume of new housing supply and contributing to suppressed price growth in Australia’s big cities has not affected most of regional Australia. Oh, and then there’s housing affordability. 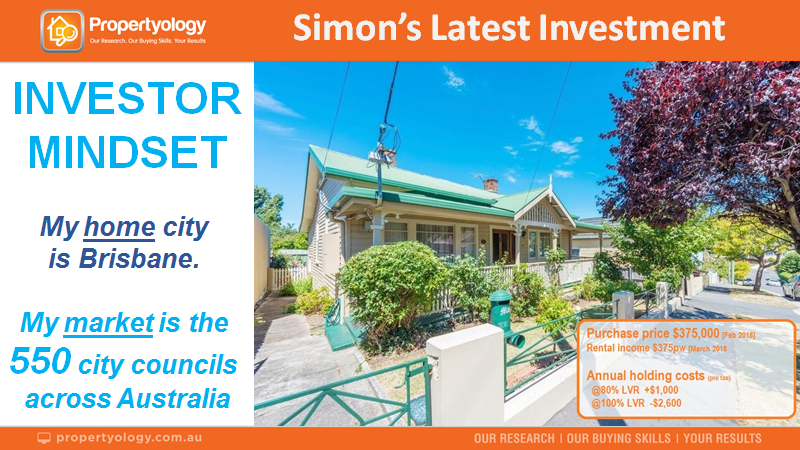 Within the handful of exciting non-capital city locations that Propertyology’s multi-award-winning buyers agents are actively investing in right now, a typical property costs between $250,000 and $450,000. Depending on each individual client’s gearing level, the annual holding costs range from cash flow positive by $3,000 to cash flow negative of $3,000. Who can’t afford that? Still need convincing about why one needs to open the other 75 per cent of their mind? Property prices more than doubled in just 5 years in Cairns, PerthPerth, TAS Perth, WA, Mackay, Darwin, Margaret River, Hobart and Toowoomba during the 5 years ending December 2007.Over the same time, the median house price in Sydney increased by just 25 per cent while a comparable property in Townsville increased by 150 per cent (that’s 6 times higher). Property investors would be wise to recognise the staggering numbers in this chart. 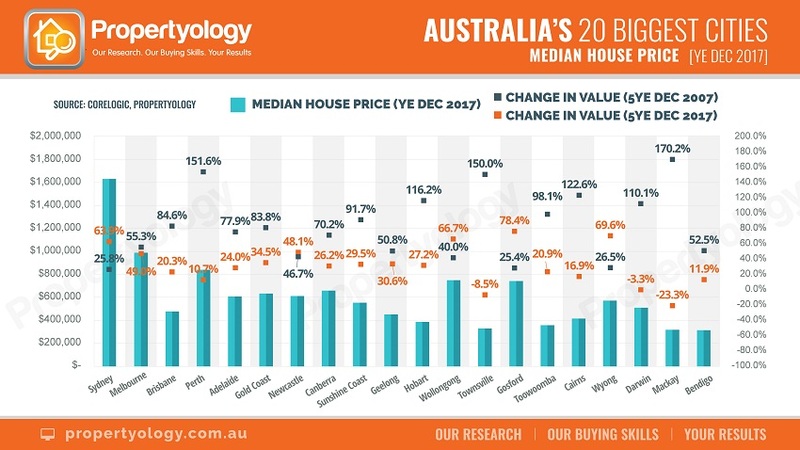 Truth be known that, across the 15-year period since the turn of the century, Australia’s best performed property markets where in parts of regional Australia, not capital cities. Fact. While most of those regional stars have been disappointing over recent years, every market is susceptible to lean periods and strong years. According to Core Logic, the median dwelling value in Australia’s third largest city, Brisbane, increased by a paltry 10.3 per cent over the 10 years ending January 2018. And a typical property in our fourth largest city, Perth, had fallen in value by 6.9 per cent over the same 10-year period. Yuk! But the period that was bookended by the (2000) Sydney Olympic Games and the (2008) Global Financial Crisis was extremely prosperous for Australian property markets. With the same prime minister for 11 years (compared to 5 prime ministers in 6 years 2010-2015), it was a period of significant investment in infrastructure, strong job creation, and consistently falling unemployment rates. Regional Australia thrived year after year. Tourism, construction, our resources sector,agriculture, and manufacturing were mostly healthy. Stable leadership and planning beyond the next federal or state election meant that our nation kept moving forward, the economy was strong, and confidence (business and consumer) was consistently high. Housing has always been significantly more affordable and lifestyles very appealing in much of regional Australia. But, back then, year after year of strong economic development was the carrot that consistently drew rates of population growth that exceeded capital cities. A typical property in Cairns increased in value by 122 per cent in just 5 years (more than doubling its value)! During those same years, Armidale (100 per cent), Toowoomba (98 per cent), Gold Coast (83 per cent), Hobart (116 per cent), and Dubbo (65 per cent) were among a long listof gold-star performers. Other locations like Margaret River (156 per cent), Mackay (170 per cent), and Geraldton (176 per cent) were off the charts. It’s stating the obvious to say that price growth is now well overdue in large parts of regional Australia. Those who doubt Propertyology’s belief that regions are on the rise might need reminding that it’s not that long ago that the state of Tasmania was in recession – the state’s capital is today the run-away leading property market in all of Australia! As Australia’s only analyst to pick Hobart’s remarkable rebound, Propertyology has used the same methodology to strategically select a few regional markets for our buyers agents to help people invest in property. Regions are on the rise! Propertyology’s buyer’s agents are seeing unfold right before their very eyes every day. It’s exciting! While it is most unlikely that we’ll see property values double in the next 5 years, the potential for some strategically-chosen regional city property markets to outperform most (if not all) capital city markets is well and truly on the cards. From a vantage point of spending every day analysing every market (capital cities and non-capitals), I personally invested in an exciting regional city as recently as February 2018. For an affordable purchase price of $375,000, the large 3-bedroom house pictured below is cash flow neutral while the capital growth potential is far superior to capital city markets. Propertyology is a Brisbane-based buyer’s agency and (national) research firm. They help everyday people to invest in strategically-chosen locations all over Australia. The multi-award-winning firm’s success includes 2018 REIQ Buyer’s Agency of the Year and being a finalist in the 2017 Telstra Business Awards. Simon Pressley is an REIA Hall of Fame Inductee.